On July 4, 2006, during a late night swim with friends, Blake Heidenreich suffered a diving accident and broke his C3 and C4 vertebrae in his neck, leaving him paralyzed from the shoulders down and on a ventilator. Unable to speak due to the ventilator, Blake's outward communication was limited. The doctors answered Blake's question of "will I ever walk again?" with "let's focus on breathing independently first." Life has its bumps in the road, but Blake found himself at the foot of a mountain that would challenge him for the rest of his life. 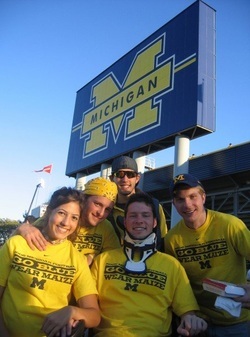 After spending a few weeks in the ICU at Beaumont in Royal Oak, Michigan, Blake was transferred to the University of Michigan Hospital in Ann Arbor, Michigan. With the support of his friends and family, Blake made the mental decision to embrace his new situation as a challenge, one which would continuously test his character and physical abilities. Beyond all odds, after four and a half months of intense physical therapy, Blake walked out of the hospital with only the use of a cane. Blake returned to school and graduated with his BBA from the the University of Michigan Ross School of Business. Diploma in hand, he pursued his dream and started his career at Deloitte Consulting. In his move to a local role, Blake worked at Google in Ann Arbor before returning to graduate school at the University of Michigan for an MS from the School for Environment and Sustainability. Blake currently manages Troy Capital Management LLC, an investment fund he co-founded. With firsthand knowledge of the challenges faced by individuals with SCI, and an understanding that his career opportunities were a direct result of his education, Blake founded the Spinal Cord Injury Foundation to support others with SCI in pursuing a career. Blake knows that other individuals with an SCI have the ability to be successful in life, but with their new life challenges an education is of increasing importance. As you reflect on how your education has impacted your life, we ask that you consider helping individuals with an SCI through a donation to the Spinal Cord Injury Foundation.